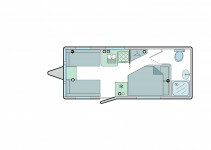 The first choice for your first caravan, the all-new Bailey Phoenix has arrived this August in a choice of seven different layouts, including two new four-berth island bed options (640 & 644) and a six-berth twin-axle family layout (760). All models are surprisingly light for vehicles with so much interior space and as such are the perfect match for a wide range of tow-cars. Making you safe and secure on the road, exteriors feature a combination of flush-fit front and rear impact resistant bumpers, AL-KO AKS 3004 Stabiliser and WSL Individually Laser Balance wheels fitted with ‘security’ tyres and ant-tamper WSL Safety Bolts. With its signature GRP skinned polar white body shell panels and a new-look graphics scheme, the spacious interiors are beautifully showcased by the striking ‘room with a view’ vertical front picture window to ensure that it stands out from the crowd. As with all Bailey leisure vehicles, models are built using our patented Alu-Tech construction technology, cloaked in a GRP outer skin, making them more robust, more durable and yet lighter than those manufactured using conventional methods to offer greater protection against the elements to keep you comfortable, safe and secure all year round. To date approaching 50,000 Bailey leisure vehicles have been built with this groundbreaking technology and are currently being used around the world. Inside the new ‘Eucalyptus’ furniture finish combines perfectly with the ‘Brockwell’ soft furnishings, and ‘Brushed Champagne’ Italian design overhead locker doors to create a look and feel found in the Phoenix’s upmarket siblings . To complete the fresh look the ‘Nordic Stone’ kitchen and worktop laminates, ‘Soft Truffle’ loose fit drop in carpets and new locker LED lighting creating a dynamic and luxurious feel throughout as you kick-off your shoes in the beautiful surroundings. NEW Double glazed Polyplastic opening vertical skylight with night blind in front dome. Price Guarantee: These prices are guaranteed subject to you ordering your caravan from the earliest production availability and that you take delivery within 14 days of dispatch from the factory. Retailer delivery charge: Your Bailey retailer will make a charge of up to £565 to cover the cost of various additional services carried out prior to you taking possession of your new Bailey tourer. The main element of this charge will be the cost of transporting your tourer from the Bailey factory to your vending retailer’s premises. Your Bailey retailer can confirm the details of the additional services available prior to making your choice.